Although partial solar eclipses are quite common and can occur four to seven times a year, total solar eclipses are rare. The number of viewable total solar eclipses are even fewer because in order to be seen, the shadow of the moon during an eclipse must pass over human reachable regions on Earth. Since two-thirds of the Earth is covered by water a large number of total solar eclipses pass over oceans and other remote areas. 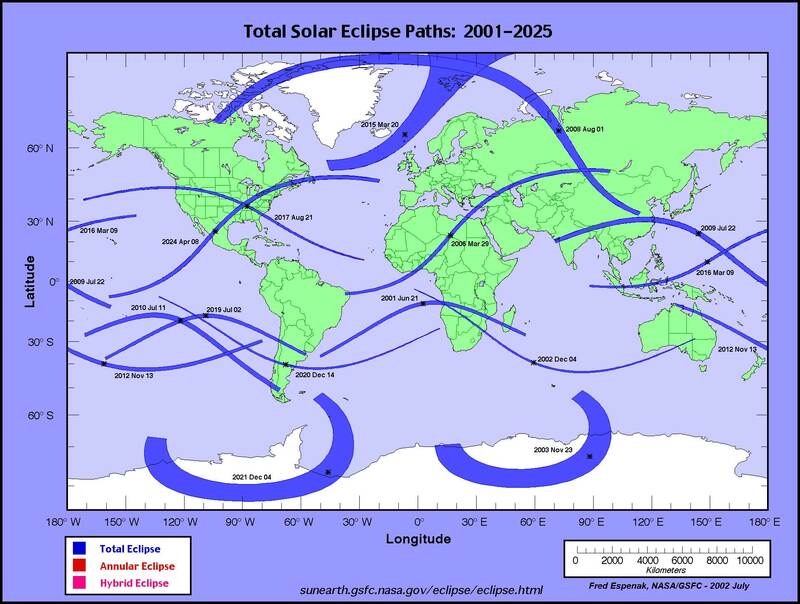 This world map (full size) from NASA shows the paths of all total solar eclipses that occurred and will occur from 2001 till 2025. As it can be seen from the map, most of Europe won’t see a total solar eclipse at least till 2026. Unless you live in one of a few of Europe’s geographical extremities (i.e. the Faeroe Islands, Spitsbergen, Nova Zembla, Abkhazia and other parts of eastern Georgia or the southern part of Russia), the astronomical phenomenon will pass you by. North Americans will witness a total solar eclipse on August 21, 2017, close to Memphis, Tennessee. And on April 8, 2024, an eclipse will be visible in a band stretching from Maine to Mexico. South America are more lucky. They will have three solar eclipses. On July 11, 2010 and again on July 2, 2019, eclipses will be visible across two different bands of Chile and Argentina. The third one will occur over Patagonia on December 14, 2020. The entire continent of Africa won’t witness a single eclipse for at least two full decades. The huge landmass of Asia too won’t see any bands of darkness for the same period.